The Royal Italian Army was the army of the Kingdom of Italy from the unification of Italy in 1861 to the birth of the Italian Republic in 1946. In World War II the Royal Army fought first as part of the Axis (1939–43) and then as a co-belligerent of the Allies (1943–45). After the monarchy ended, the army changed its name to become the Italian Army. The Italian Royal Air Force was the name of the air force of the Kingdom of Italy. 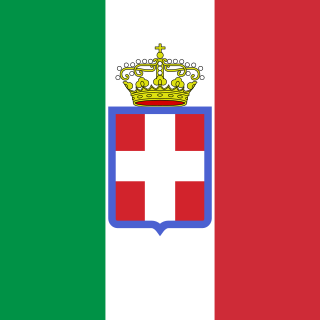 It was established as a service independent of the Royal Italian Army from 1923 until 1946. In 1946, the monarchy was abolished and the Kingdom of Italy became the Italian Republic, whereupon the name of the air force changed to Aeronautica Militare. No. 237 Squadron was a Royal Air Force aircraft squadron. During the Second World War the unit was formed from No. 1 Squadron Southern Rhodesian Air Force for operations in North Africa. Wajir is the capital of the Wajir County of Kenya. It is situated in the former North Eastern Province. East Africa Protectorate was an area in the African Great Lakes occupying roughly the same terrain as present-day Kenya from the Indian Ocean inland to the border with Uganda in the west. Although part of the dominions of the Sultanate of Zanzibar, it was controlled by Britain in the late 19th century; it grew out of British commercial interests in the area in the 1880s and remained a protectorate until 1920 when it became the colony of Kenya, save for an independent country 16-kilometre-wide (10 mi) coastal strip that became the Kenya protectorate. Italian East Africa was an Italian colony in the Horn of Africa. It was formed in 1936 through the merger of Italian Somaliland, Italian Eritrea, and the newly occupied Ethiopian Empire which became Italian Ethiopia. A viceroy is an official who runs a country, colony, city, province, or sub-national state, in the name of and as the representative of the monarch of the territory. The term derives from the Latin prefix vice-, meaning "in the place of" and the French word roy, meaning "king". A viceroy's territory may be called a viceroyalty, though this term is not always applied. The adjective form is viceregal, less often viceroyal. The term vicereine is sometimes used to indicate a female viceroy suo jure, although viceroy can serve as a gender-neutral term. Vicereine is more commonly used to indicate a viceroy's wife. Addis Ababa is the capital and largest city of Ethiopia. According to the 2007 census, the city has a population of 2,739,551 inhabitants. Asmara or Asmera is the capital and most populous city of Eritrea, in the country's Central Region. It sits at an elevation of 2,325 metres (7,628 ft), making it the sixth highest capital in the world by altitude. The city is located at the tip of an escarpment that is both the northwestern edge of the Eritrean highlands and the Great Rift Valley in neighbouring Ethiopia. In 2017, the city was declared as a UNESCO World Heritage Site for its well-preserved modernist architecture. Asmara was first settled in 800 BC with a population ranging from 100 to 1000. The city was then founded in the 12th century CE after four separate villages unified to live together peacefully after long periods of conflict. 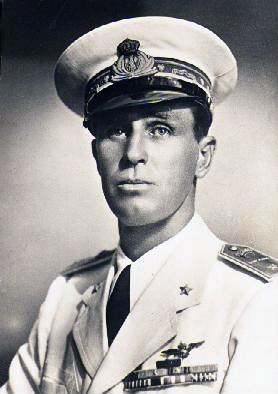 Luigi Frusci was an officer in the Italian Royal Army during the Italian conquest of Ethiopia and World War II. He was the last Itialian Governor of Eritrea and Amhara (Ethiopia). Jimma, also spelled Jima, is the largest city in south-western Ethiopia. It is a special zone of the Oromia Region and is surrounded by Jimma Zone. It has a latitude and longitude of 7°40′N36°50′E. The town was the capital of Kaffa Province until the province was dissolved. Prior to the 2007 census, Jimma was reorganized administratively as a special Zone. 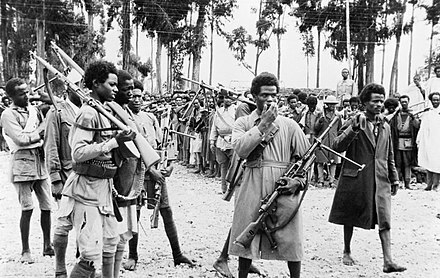 While Debre Markos and Addis Derra were being captured, other Ethiopian Patriots under Ras Abebe Aregai consolidated themselves around Addis Ababa in preparation for Emperor Selassie's return. 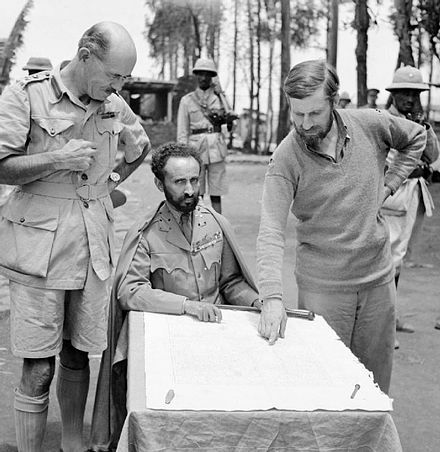 In response to the rapidly advancing British and Commonwealth forces and to the general uprising of Ethiopian Patriots, the Italians in Ethiopia retreated to the mountain fortresses of Gondar, Amba Alagi, Dessie and Gimma. 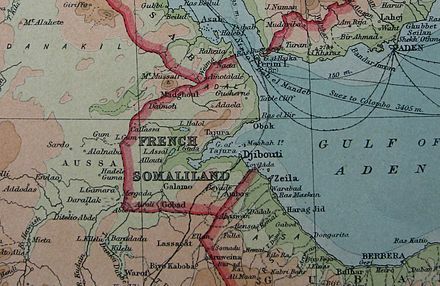 After negotiations prompted by Wavell, Aosta ordered the governor, Agenore Frangipani, to surrender the city to forestall a massacre of Italian civilians, as had occurred in Dire Dawa. Ashamed of not being allowed by his superior to fight to the death in the old style, the Italian governor, General Agenore Frangipani, killed himself with poison the next day. ↑ Schreiber, Stegemann & Vogel 1995, p. 263. 1 2 Playfair 1954, p. 403. ↑ Schreiber, Stegemann & Vogel 1995, pp. 262–263. 1 2 Schreiber, Stegemann & Vogel 1995, p. 295. 1 2 Prasad 1963, p. 160. 1 2 3 Playfair 1954, pp. 400–401. ↑ Playfair 1954, pp. 411–417. ↑ Playfair 1954, pp. 417–419. ↑ Playfair 1954, pp. 418–420. ↑ Stewart 2016, pp. 217–219. ↑ Playfair 1954, p. 401. Gideon Force was a small British and African special force, which acted as a Corps d'Elite amongst the Sudan Defence Force, Ethiopian regular forces and Arbegnoch (Patriots) fighting the Italian occupation in Ethiopia, during the East African Campaign of World War II. The leader and creator of the force was Major Orde Wingate. At its peak, Gideon Force had fifty officers, twenty British NCOs, 800 trained Sudanese troops and 800 partially-trained Ethiopian regulars, a few mortars but no artillery and no air support except for intermittent bombing sorties. Middle East Command, later Middle East Land Forces, was a British Army Command established prior to the Second World War in Egypt. Its primary role was to command British land forces and co-ordinate with the relevant naval and air commands to defend British interests in the Middle East and eastern Mediterranean region. The Battle of Keren was fought as part of the East African Campaign during the Second World War. The engagement took place from 5 February to 1 April 1941, between a mixed Italian army of regular and colonial troops and British and Free French forces. The town of Keren, in the colony of Italian Eritrea, was of strategic importance to both sides in 1941. 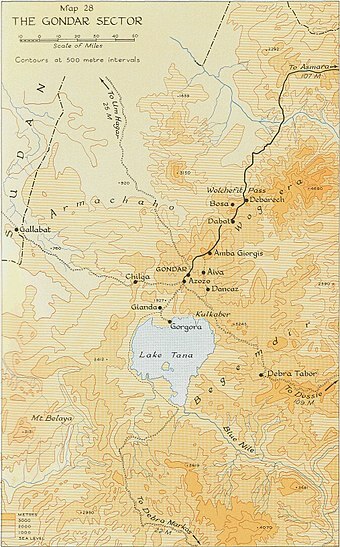 The road and railway through Keren were the main routes to the colonial capital at Asmara and the Red Sea port of Massawa, which surrendered to the British after the battle. The Order of Battle, East African Campaign shows the ground forces available to both sides in East Africa on the date that the Italians declared war on Britain and France, 10 June 1940. An update is also provided for the British and Commonwealth forces involved in the 1941 offensive. 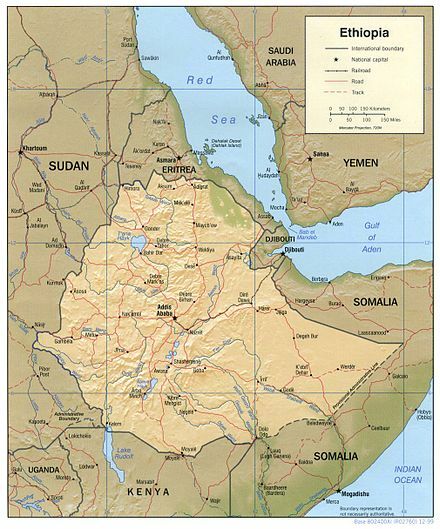 The Italian conquest of British Somaliland was part of the East African Campaign (1940–1941), which took place in August 1940 between the metropolitan Italian, Eritrean and Somali forces of Fascist Italy and British, Commonwealth and Somali irregulars. The Italian expedition was intended to exploit mobility and speed but was hampered by the Somali terrain, rainy weather and the British defence of the colony, particularly at the Battle of Tug Argan. The 65th Infantry Division "Grenadiers of Savoy" was an infantry division of the Italian Army during World War II. It was created 12 October 1936 in Littoria (Latina) and was officially dissolved 20 April 1941 in Soddu, Ethiopia. The Attack on Nibeiwa took place on 9 December 1940 near Nibeiwa, Egypt, when the Italian fortified camp held by the Maletti Group, the armoured force of the 10th Army, was overrun by British and Indian troops. The attack was the opening engagement of Operation Compass a British raid which, if successful, would be followed up to try to expel the Italians from Egypt. Italy had declared war on France and Britain on 10 June and in the Italian invasion of Egypt from 9–16 September 1940, the Italian 10th Army had reached Sidi Barrani and dug in to await the completion of the Via della Vittoria, an extension of the Via Balbia, being built from the frontier; the Maletti Group garrisoned a camp at Nibeiwa,12 mi (19 km) south of the port of Sidi Barrani. 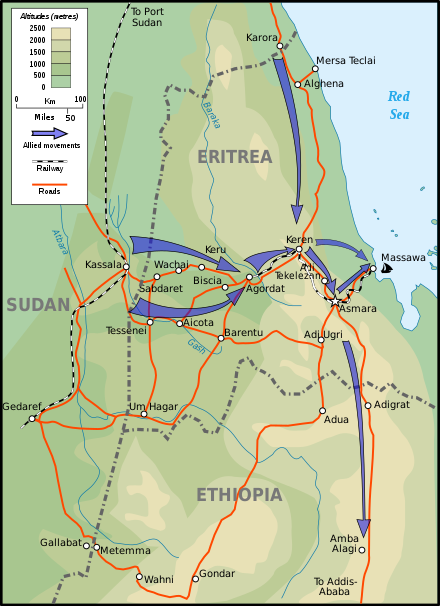 Operations on the Northern front, East Africa, 1940 in the Second World War, were conducted by the British in Sudan and the Italian Comando Forze Armate dell'Africa Orientale Italiana in Eritrea and Ethiopia. On 1 June 1940, Amedeo, Duke of Aosta the Viceroy and Governor-General of the Africa Orientale Italiana, commander in chief of Comando Forze Armate dell'Africa Orientale Italiana and Generale d'Armata Aerea, had about 290,476 local and metropolitan troops and by 1 August, mobilisation had increased the number to 371,053 troops. General Archibald Wavell, General Officer Commanding-in-Chief (GOC-in-C) of Middle East Command, had about 86,000 troops at his disposal for Libya, Iraq, Syria, Iran and East Africa. About 36,000 troops were in Egypt and 27,500 men were training in Palestine. The Battle of Agordat was fought near Agordat in Eritrea from 26 to 31 January 1941, by the Italian army and Royal Corps of Colonial Troops against British, Commonwealth and Indian forces, during the East African Campaign of the Second World War. The British had the advantage of breaking Italian codes and cyphers before the offensive and received copious amounts of information from Italian sources on the order of battle and plans of the Regia Aeronautica and the Italian army. Operation Appearance was a British landing in British Somaliland on 16 March 1941 against troops of the Italian Army. In August 1940, seven months previous, the British had withdrawn from British Somaliland, after it had been invaded by the Italian army. The British and Empire forces from the United Kingdom, British India, Australia and South Africa conducting Appearance made the first successful Allied beach landing of the war and retook the colony. The Battle of Tug Argan was a land battle between forces of the British Empire and Italy, which took place on 11–15 August 1940 in what was British Somaliland. The struggle determined the outcome of the Italian conquest of British Somaliland, Fascist Italy's successful attempt to conquer the latter British colony, and thus formed a part of the larger East African Campaign of the Second World War. Brett-James, Antony (1951). Ball of Fire – The Fifth Indian Division in the Second World War. Aldershot: Gale & Polden. OCLC 4275700 . Retrieved 5 March 2016. Collins, D. J. E. (1964). Prasad, B., ed. The Royal Indian Navy 1939–1945. Official History of the Indian Armed Forces In the Second World War (online ed.). Delhi: Combined Inter-Services Historical Section (India & Pakistan). OCLC 4079794 . Retrieved 9 March 2016. Ellsberg, Edward (1946). Under the Red Sea Sun . New York: Dodd, Mead. ISBN 978-0-8371-7264-4. OCLC 1311913. Gill, G. Hermon (1957). "Chapter 5, R. A. N. Ships Overseas June–December 1940" (PDF). Royal Australian Navy, 1939–1942. Australia in the War of 1939–1945, Series 2. I (online ed.). Canberra, ACT: Australian War Memorial. pp. 140–246. OCLC 848228 . Retrieved 20 February 2016. Maravigna, P. (1949). Come abbiamo perduto la guerra in Africa[How We Lost the War in Africa] (in Italian). Roma: Tosi. OCLC 22043823. Orpen, N. (1968). East African and Abyssinian Campaigns. South African Forces, World War II. I (online ed.). Cape Town, SA: Purnell. OCLC 499914466 . Retrieved 7 March 2017. Playfair, Major-General I. S. O.; et al. (1954). Butler, J. R. M., ed. 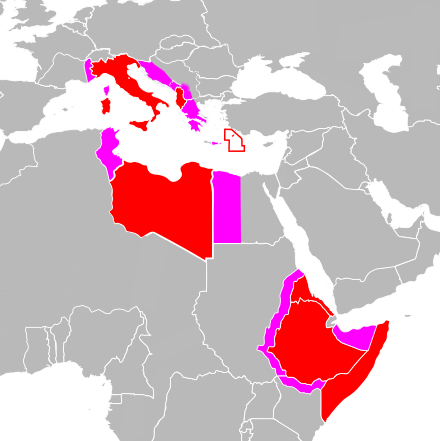 The Mediterranean and Middle East: The Early Successes Against Italy (to May 1941). History of the Second World War, United Kingdom Military Series. I. HMSO. OCLC 494123451 . Retrieved 3 September 2015. Qureshi, N. A.; et al. (1963). Prasad, Bisheshwar, ed. East African Campaign, 1940–41. Official History of the Indian Armed Forces In the Second World War (1939–1945) (online ed.). Delhi: Combined Inter-Services Historical Section (India & Pakistan). OCLC 480344871 . Retrieved 23 February 2016. Richards, Denis (1974) . Royal Air Force 1939–1945: The Fight At Odds. I (pbk. ed.). London: HMSO. ISBN 978-0-11-771592-9 . Retrieved 23 February 2016. Roselli, A. (2007). Storie segrete: operazioni sconosciute o dimenticate della seconda guerra mondiale[Secret History: Unknown or Forgotten Operations of World War II]. Biblioteca universale (in Italian). Pavia: Iuculano. ISBN 978-88-7072-766-1. Roskill, S. W. (1957) . Butler, J. R. M., ed. The Defensive. History of the Second World War United Kingdom Military Series: The War at Sea 1939–1945. I (4th impr. ed.). London: HMSO. OCLC 881709135 . Retrieved 19 February 2016. Rovighi, Alberto (1988) . Le Operazioni in Africa Orientale: (giugno 1940 – novembre 1941)[Operations in East Africa: (June 1940 – November 1941)] (in Italian). Roma: Stato Maggiore Esercito, Ufficio storico. OCLC 848471066. Santoro, G. (1957). L'aeronautica italiana nella seconda guerra mondiale [The Italian Air Force in WWII](PDF). II (1st ed.). Milano-Roma: Edizione Esse. OCLC 60102091 . Retrieved 7 March 2016. Waters, S. D. (1956). The Royal New Zealand Navy. Official History of New Zealand in the Second World War 1939–45 (New Zealand Electronic Text Centre ed.). Wellington, NZ: War History Branch, Dept. of Internal Affairs. OCLC 11085179 . Retrieved 23 February 2016. Weller, G. (1942). The Belgian Campaign in Ethiopia: A Trek of 2,500 Miles Through Jungle Swamps and Desert Wastes (online ed.). New York: Belgian Information Center. OCLC 1452395 . Retrieved 3 March 2016. Hammerton, John, ed. (25 April 1941). "South Africans Won the Race to Addis Ababa". The War Illustrated . London: William Berry. 4 (86). OCLC 220168380 . Retrieved 18 October 2008. Marino, F. (2009). Military Operations in the Italian East Africa, 1935–1941: Conquest and Defeat (MMS). Quantico, VA: USMC Command and Staff College. OCLC 832080928 . Retrieved 22 February 2016. Antonicelli, Franco (1961). Dall'antifascismo alla resistenza: Trent'anni di storia italiana 1915–1945[From Antifascism to Resistance: Thirty Years of Italian History 1915–1945]. Saggi (in Italian) (Mondadori ed.). Torino: Einaudi. OCLC 859627877. Brett-James, Antony (1951). "From Pillar to Post, June–October 1941". Ball of Fire: The Fifth Indian Division in the Second World War. Aldershot: Gale & Polden. OCLC 4275700 . Retrieved 19 February 2016. Cocchia, A. (1958). La Marina italiana nella seconda guerra mondiale[The Italian Navy in the Second World War]. Roma: Ufficio storico della marina militare. OCLC 859874678. Del Boca, Angelo (1986). Italiani in Africa Orientale: La caduta dell'Impero[Italians in East Africa: The Fall of the Empire] (in Italian). Roma-Bari: Laterza. ISBN 978-88-420-2810-9. Lupinacci, Pier Filippo; Cocchia, Aldo (1961). La Marina italiana nella seconda guerra mondiale: Le operazioni in Africa Orientale[The Italian Navy in the Second World War: Operations in East Africa] (in Italian). X (1st ed.). Rome: Ufficio Storico della Marina Militare Italiana. pp. 187–197. OCLC 955801310. Nafziger, G. (2012) . Nafziger Orders of Battle Collection: Finding Aid (online ed.). Fort Leavenworth, KS: Combined Arms Research Library (US Army Command and General Staff College). OCLC 528648446 . Retrieved 10 March 2016. Vincent, J-N.; Spivak, M.; Léoni, A. Les forces françaises dans la lutte contre l'Axe en Afrique[French Forces in the Fight against the Axis in Africa] (in French). 1983–1985. Paris: Ministère de la défense, Etat-major de l'Armée de terre, Service historique. ISBN 978-2-86323-017-6. Anglim, S. J. (2007). Orde Wingate and the British Army 1922–1944: Military Thought and Practice Compared and Contrasted (PhD). ISNI 0000 0001 3424 7296. University of Wales, Aberystwyth. OCLC 828579432 . Retrieved 25 February 2016. 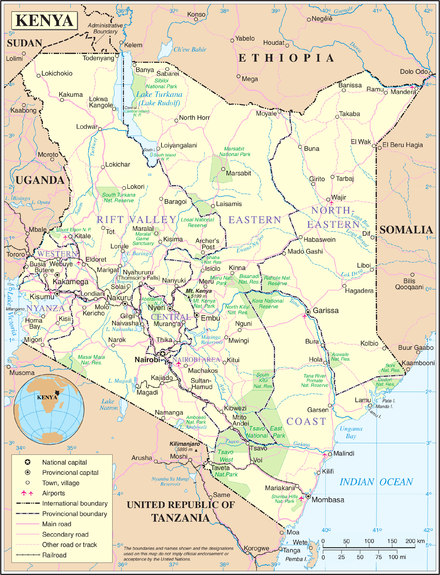 Wikimedia Commons has media related to East African campaign .